Baele’s challenge to transfer those sensations from photographs to paintings weighs heavily on Reid, like an obligation, as she works in her downtown studio. 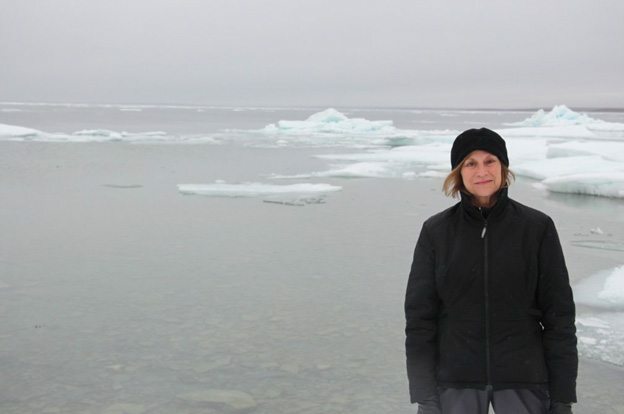 Enthralled as she was by the scenery and the people at the top of the world, Reid also experienced a “sinking feeling” of “the eventual catastrophe” coming to the North through a combination of economic development and environmental change. It is this sensation that drives the story Reid wants her paintings to tell. 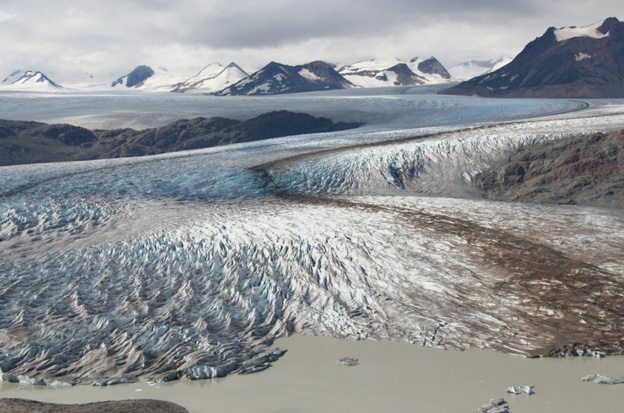 Among the first paintings created for Mapping Time is a majestic scene from the Llewellyn Glacier, which is part of the Juneau Icefield that borders British Columbia, the Yukon, and Alaska. Pointed glaciers stand in a row like soldiers guarding a distant mountain. Another painting shows the silted tendrils of a “braided stream” flowing from Kaskawulsh Glacier in the Kluane Icefield in the Yukon. 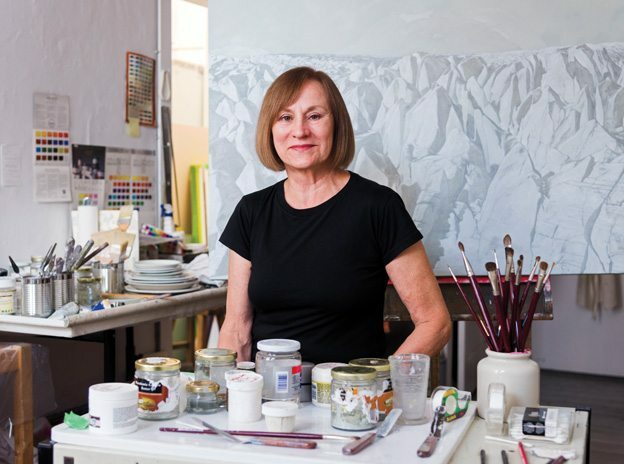 Although Reid is a lifelong artist, painting is hard on her eyes, which were damaged first at birth and later, as an adult, in a fall so traumatic that she could not paint for five years, the world appearing double and on a slant. Her improved vision since then seems to owe more to willpower than to medicine. She now sees the world as it really is — or at least as an artist sees it, as this artist sees it. Indeed, the landscapes depicted in these initial Mapping Time paintings resemble the photos but softened. It is like looking at the memory of the landscape rather than the landscape itself. 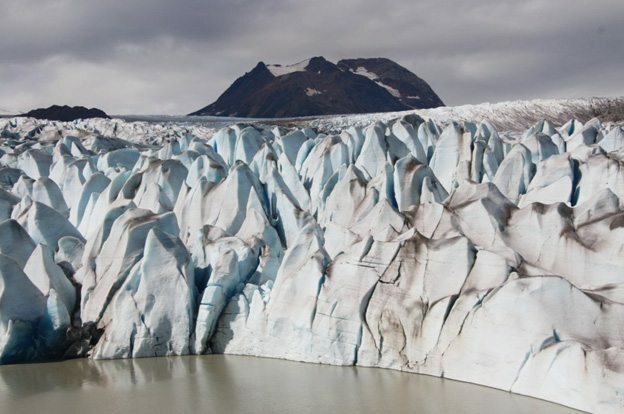 It is also peering into an increasingly fragile future in which climate change melts glaciers and threatens the environment. Thus, the paintings simultaneously exalt and mourn the North. Reid constantly bumped into her father’s ghost. 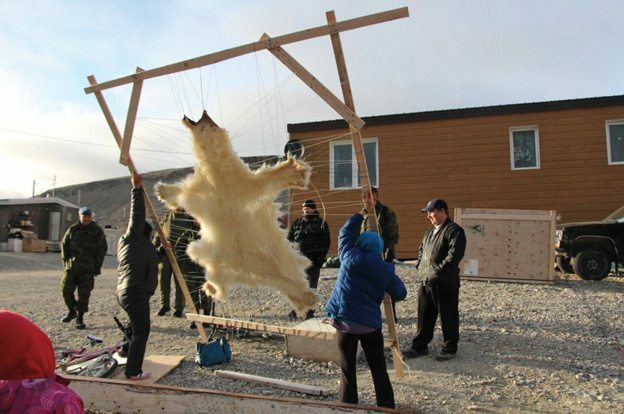 In Resolute, which is located on the northern tip of Resolute Bay and is considered one of Canada’s most northern communities, Reid encountered a couple of Inuit hunters stretching a polar bear hide. She was suddenly transported back to her childhood and to the polar bear rug her father had brought from the North. Little Leslie would sit on the rug to play with dolls her father had purchased in foreign countries he visited. In a shop in Iqaluit, Reid felt compelled to purchase two dolls dressed in Inuit garb. It was the kind of thing her father would have done. In Whitehorse, she discovered gold nugget earrings similar to those her father once brought her mother. Reid wore her mother’s gold nugget earrings during a presentation she gave this past summer on her Arctic trip to an overflow audience of artists and curators at Arts Court. That presentation has made Reid’s Mapping Time exhibition among the most highly anticipated shows of the 2015 local arts calendar. The first batch of paintings will be unveiled in March at Galerie Laroche/Joncas in Montreal. Later in the year, another batch will be shown at Ottawa’s Galerie St. Laurent + Hill. 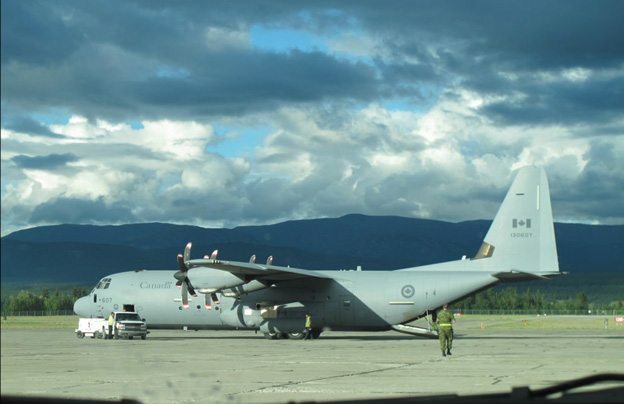 An installation of Reid’s photographs is tentatively planned for the Military Museums in Calgary next year, and the Canadian War Museum has expressed interest in acquiring some of the images.